These satellite images — see video, below — reveal the extent and damage of a huge wildfire in Portugal’s tourist region of Algarve. The blaze, which affected 23,500 hectares of land around Monchique, has burnt through eucalyptus forests and forced hundreds to flee. 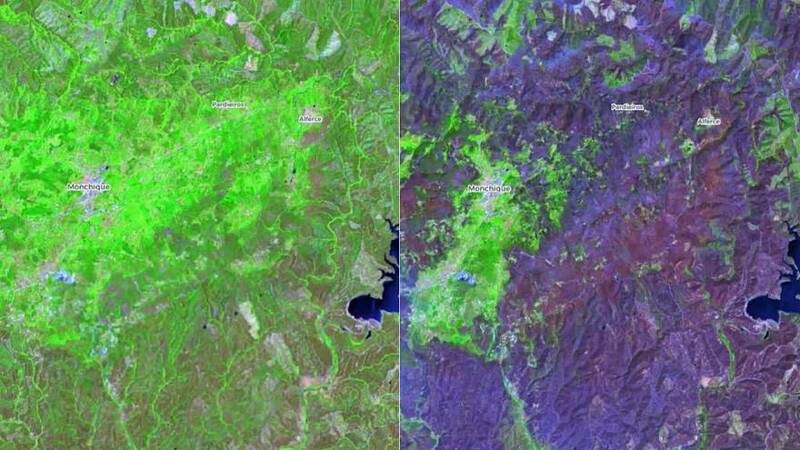 Copernicus, the EU’s earth observation programme, took the before-and-after pictures using its Sentinel-2 satellite. It captures lush green landscape on July 19, which is in stark contrast to images from August 8, which show a dark purple colour dominate the map. The fire started during an extreme heatwave, which jolted Portugal out of a relatively cool summer and sparked instant memories of tragic fires last year — the worst on record — which killed 114 people. By Friday, August 10, firefighters appeared to have the blaze under control but remain on maximum alert should the situation change, according to Portugal’s civil protection authority.